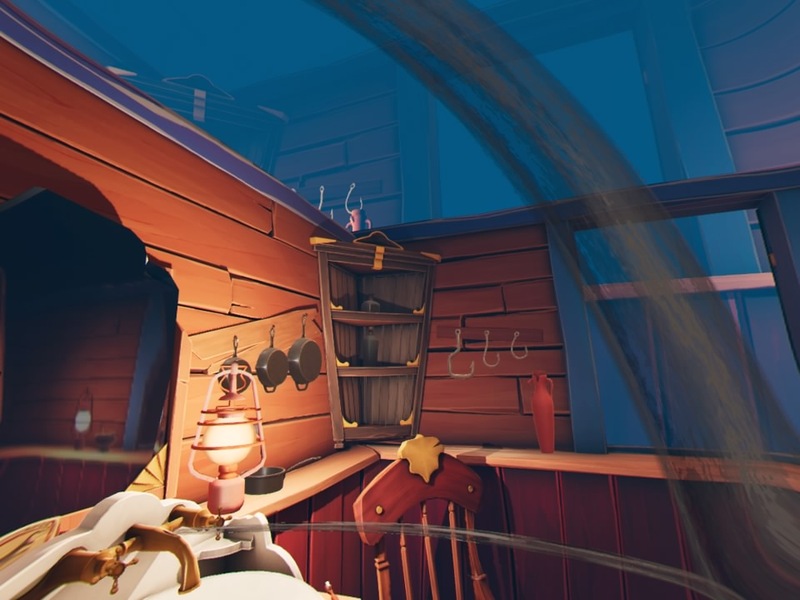 A Fisherman’s Tale from Innerspace VR has arrived on PSVR and is a story based puzzle game. You’re going to need two Move controllers for this one and a decent helping of spatial awareness. You play from the perspective of a puppet version of a lighthouse keeper. A brief tutorial has you teleporting around, brushing his teeth, putting a log into a furnace, opening a window and, most importantly, putting the finishing touches to a replica model of his lighthouse. This scale model is a perfect replica of the space he lives in, all the way down to a little model of himself. 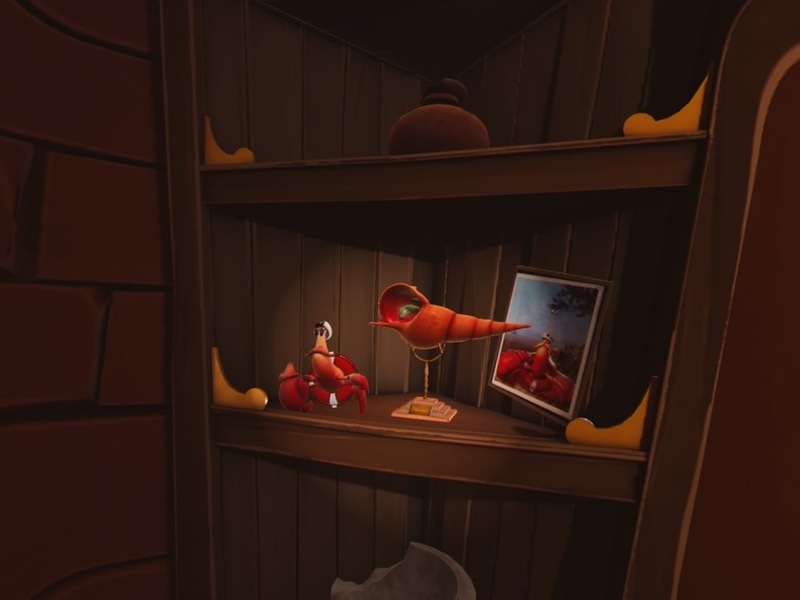 In the following chapter the lighthouse keeper becomes aware that the little model version of himself mimics his every move, so picking up a pan in his room sees his little model version pick up a tiny pan. 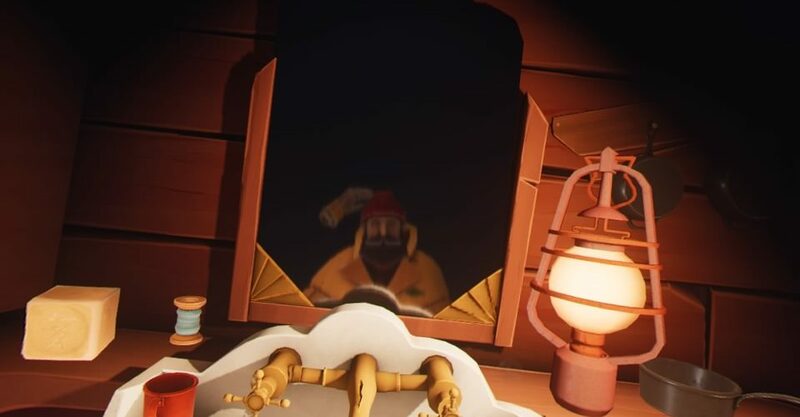 Not only that but it seems the lighthouse keeper is himself in a smaller model within a larger lighthouse and the giant version of himself also mimics all his actions. This is the basis for the majority of the puzzles in the game. If you require a smaller version of an object you need to retrieve it from the smaller version of your house, whereas a larger version can’t be reached, but by making the giant version of your mimic your actions you can get him to hand you what you need. It takes a little getting used to but the puzzles aren’t too taxing and there aren’t actually that many of them. There are only four chapters, plus a prologue and an epilogue, and most only have two or three puzzles at most. Also, despite claims that you are one in an infinite number of models you only ever interact with the one above you and the one below you, there’s never a need to go multiple layers deep meaning once you’ve figured out how things work you’re set for all the puzzles. The final chapter has a slight twist on the formula but it is also the shortest chapter. The entire game will probably take you around an hour and a half first time through. Once you do get the hang of things it’s only the controls that get in your way. Each Move controller is a hand, as you’d expect, and cleverly to reach things that are low down or further away you can extend your reach with a touch of a button. As mentioned earlier you teleport around and can only turn in increments but as this isn’t an action game that’s not a problem. The problem is that if an object in your hand touches a part of the scenery then it will get knocked out. This isn’t a gameplay thing or anything, you can be holding down the trigger with all your might but if you brush up against something then the object will be dropped. If it falls out of reach or out of the world then you have to wait a little while for it to respawn at its original location. It’s a very odd decision and even after mastering the puzzles I would still get frustrated as a key, rather than going into a keyhole, would fall to the floor as the game knocked it out of my hand. There is a reasonably charming story holding everything together, about a fisherman going out in a storm, but like the game itself it’s quite light and isn’t going to leave a lasting impression. It also can’t be skipped on subsequent playthroughs, which the game encourages through collectibles and trophies, but it’s light enough that it’s not too much of a hassle. So for your money you get a short, light experience that makes you think a little differently, similar to Portal in a way, but with a few annoyances. If you see it for what you believe to be a reasonable price then it is probably worth one playthrough, but it’s by no means a must buy for VR. 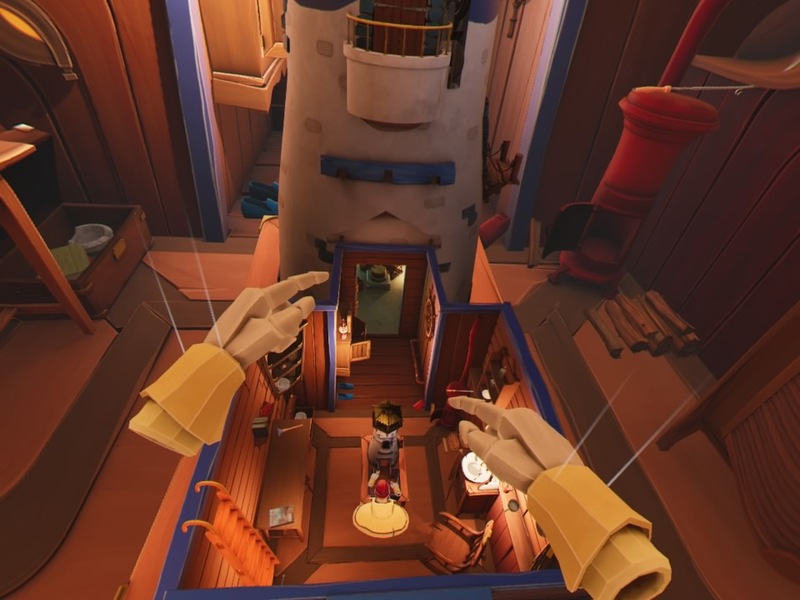 If more had been done with the puzzle concept then it could be up there with Statik for VR puzzle games, but it feels like they’ve only just scratched the surface which makes A Fisherman’s Tale just an interesting curio. A Fisherman's Tale offers a story driven experience with some light, but original, puzzles. It's a short game which doesn't do quite enough with its core idea but is a worthwhile experience for the right price.